locals. 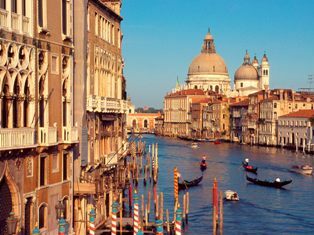 As Venice's 'Main Street' the Grand Canal is something that must be seen. The Rialto Bridge and other amazing sights mean that no visit to Venice is complete without this. A ride along the Grand Canal can easily be the highlight of a trip to Venice, and there are several ways to go about it. Grand Canal Sights along the leisurely trip include the Basilica di San Marco, the Campanile, the Doge's Palace and manu more. Gondola rides are one of the most popular things to do on a trip to Venice, despite their expense. One way to make it more affordable is to go in a group of up to six people and split the price. You may have to do a bit og haggling to arrange a price, so if you don't want to do this try to arrange it through your hotel instead. cities as they are numbered and have distinct pick up and drop off points. If you get a free map when you reach Venice you'll quickly locate a route you'd like to travel. Passenger boats, called traghetti usually go only from one side to the other, but they can still be good fun short rides. As there are not that many bridges that cross the Grand Canal along its 3km length, the traghetti can move you from one side to the other and save you long walk to one of the bridges. Since the canal ranges from 30-70m wide, your trip length can vary. Another fun option is to take one of the water taxis to one of the nearby islands. Visitors can see famed glass works, churches and more on Murano and Burano, Lido and Torcello. If you travel along the waterways in the evening you'll have a chance to take a look in some of the palaces that have large, well-lit arches. Many of them will be close enough to allow you to get an excellent view of the highly decorated interiors. If you are not sure which of them to visit during the day, a canal trip at night can help you to decide. You don't have to see the Grand Canal sights by water. An alternative option to travelling via the canal option is to take a short walk and see Venice's Natural History Museum - the Fondaco dei Turchi. This museum was built in the 13th century and it provides one of the most amzing views from a gondola. Some parts of the Natural History Museum are still under construction, but there is still much to see. You'll find a section with dinosaurs, a small aquarium and the Correr Museum.